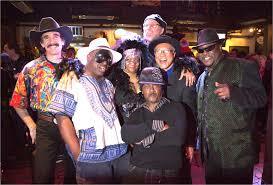 Dress up and come down to the annual Halloween party with the Funky Gators at Ashkenaz. Along with rubboard player and lead singer Myrna, the band is accordion player Dana Mandell, guitarist Ian Lamson, bassist Marty Holland, and drummer Rasheed Wedlow. Myrna was a star in Gator Beat, and after that band’s leader Richie Domingue died several years ago, she retired from the zydeco scene. But after much coaxing from fans, she and Mandell put together the Funky Gators. Myrna’s many years of R&B experience combines with Mandell’s zydeco dance knowledge to create a sound that R&B listeners enjoy and that also keeps zydeco dancers out on the floor.